At this point, iPhone and iPod stereo docks are a dime a dozen, and are basically all the same. 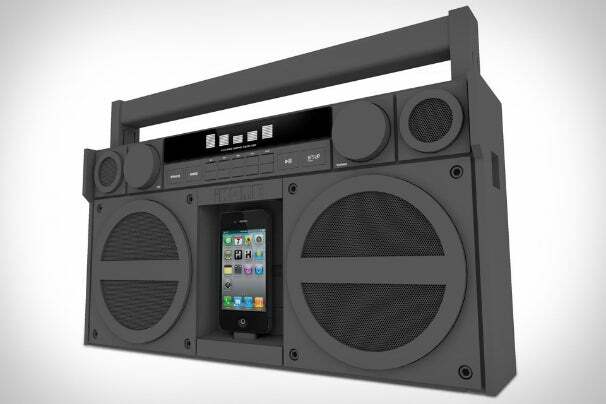 But then iHome came along with the iP4 speaker dock inspired by the classic boombox. While it exudes 80s nostalgia, the iP4 boombox also looks modern with a minimalist, square design coupled with fat plastic panels that make it look Tron-ish. It should also sound pretty good, too, thanks to a pair of 4-inch carbon-composite woofers, and two 1-inch ferro-fluid cooled tweeters. It’s also has a LCD screen that displays a equalizer, oversized backlit buttons, FM radio, Aux line-in jack for things other than an Apple device, and a handy remote that magnetically attaches. The whole thing can either be plugged in to the wall, or you can throw in six D-size batteries and lug around this 7.5-pound sound blaster down the street on your shoulder, just like the way it was meant to be. The iP4 boombox comes in matte gray or pink to keep things funky, and can be bought now for $200 directly from iHome.